We Offers Gearless Elevators for speed up 2.5 m/sec. 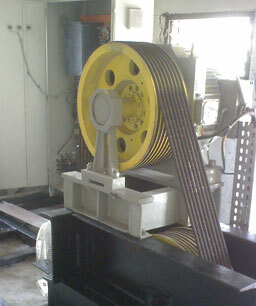 In Gearless elevator, the use of a slow speed motor directly connected to the driving sheave eliminates the necessity of using motor speed reduction gearing. The result is a machine of great simplicity. The relatively few parts and the compactness of the gearless elevator make it the ideal drive for high speed work. Smooth, steady motion of the car is assured under all conditions, although the machine is primarily designed for the high-speed service of the taller buildings.